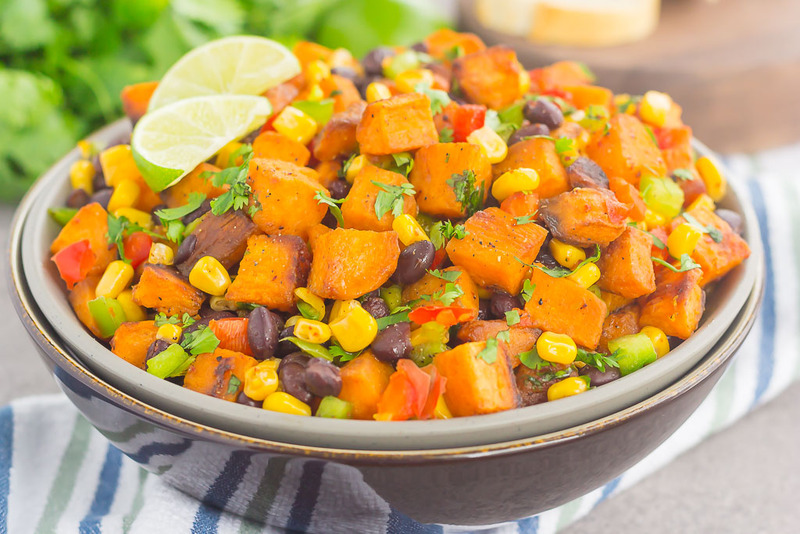 This Southwestern Sweet Potato Salad is loaded with roasted chile lime sweet potatoes, black beans, corn, cilantro, and tossed in a light honey lime dressing. It’s perfect for picnics, barbecues and sweet potato lovers everywhere! Summer is in full swing and I’m lovin’ it! Even though the weather is hot and sticky, I’ll take this heat over the cold any day of the year. After all, that’s what air conditioners were invented for, right? Which brings me to an interesting question, or really just a thought to ponder. Would you rather be cold? You know, it’s freezing outside and you’re cold, but you can bundle up in anything and everything to help get you warm. Or, would you rather be hot? There’s only so much you can take off to make you cool! I would much rather be hot than be cold. Yep, you can definitely wear all the layers when you’re cold, and like I said, can’t really remove much if you’re hot. But still…I’m always cold (even in 95 degree weather), so I’d rather be toasty, even if it means being sweaty and uncomfortable. 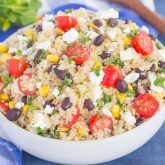 Ok, now that I’ve gotten completely off topic, let’s talk about salads today! You must know by now that I could eat salad just about every day. And sometimes I do! But, especially when the weather gets warm, I crave salads that are lighter and filled with fresh fruits or veggies. But, one type of salad that I do not like are potato salads. There’s just something about that creamy, miracle whippy, vinegary taste that doesn’t sit well with me at all. And although summer is salad season, it’s also potato salad season, which just isn’t for me. And that’s why I made my own, not miracle whippy or vinegar based potato salad. If you’re not a fan of those either, then you’ll love this one, friends! If you’re a roasted sweet potato lover like I am, then this salad was made for you. It’s not like your typical potato salad, and packs a punch of flavor with just a few simple ingredients. I lightly adapted this recipe from an older Taste of the South summer magazine that I had stashed away. As soon as I came across this dish, I knew it was a winner. The sweet potatoes are roasted with a touch of salt, pepper, and a chile lime seasoning blend that I found from Trader Joe’s. It gives these potatoes a light chile flavor, with just a hint of lime. It’s not overpowering and makes these sweet potatoes roast up with wonderful flavor. If you don’t have a Trader Joe’s near you to find this seasoning blend, a touch of chile powder or red pepper flakes would work well, too. 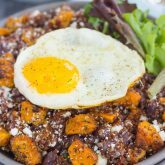 Along with the sweet potatoes, the black beans, corn, and green and red peppers give this salad that southwestern flare and crunch that pairs perfectly with the sweet potatoes. Now let’s talk about that dressing! It’s made with just three ingredients: olive oil, honey and lime juice and is light, slightly sweet and oh-so delicious. I think this might just be my go-to dressing for everything this summer! 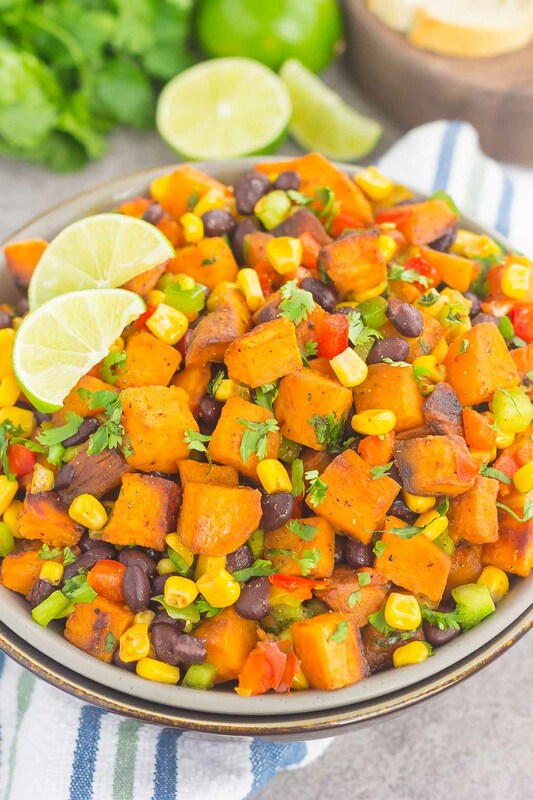 And did I mention how easy this Southwestern Sweet Potato Salad is to make? So easy, friends! 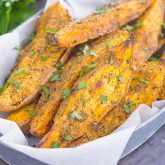 You simply roasted some cubed sweet potatoes coated in olive oil, salt, pepper and seasoning until cripsy on the outside and tender on the inside. While those ‘taters are cooking, add your veggies to a bowl, pour in the dressing ingredients and then toss in the sweet potatoes once cooked. And that’s it! This salad can be eaten either hot or cold, but I personally prefer it cold. Pop it into the refrigerator and then your easy-peasy and delicious salad is ready to go. 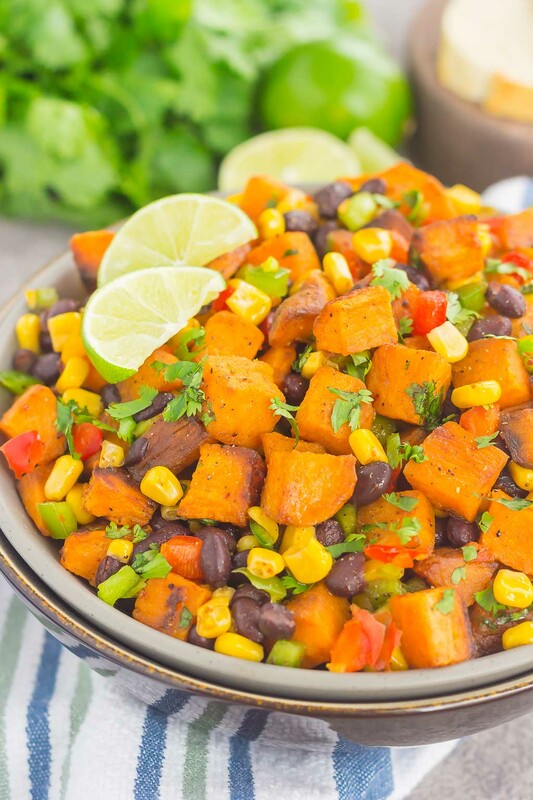 If parties, picnics, barbecues or get-togethers are headed your way, wow everyone with this simple Southwestern Sweet Potato Salad! 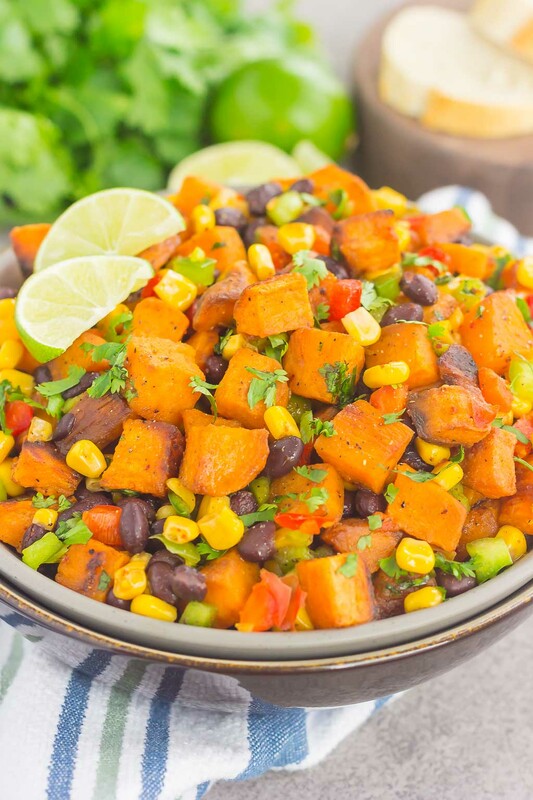 This Southwestern Sweet Potato Salad is loaded with roasted chile lime sweet potatoes, black beans, corn, cilantro, and tossed in a light honey lime dressing. It's perfect for picnics, barbecues and sweet potato lovers everywhere! In a medium bowl, combine the olive oil, salt, pepper, and chile lime seasoning. Add diced potatoes and corn and toss to coat. Spread potatoes and corn in an even layer onto prepared pan. Bake for 32-35 minutes, or until lightly browned and crispy. 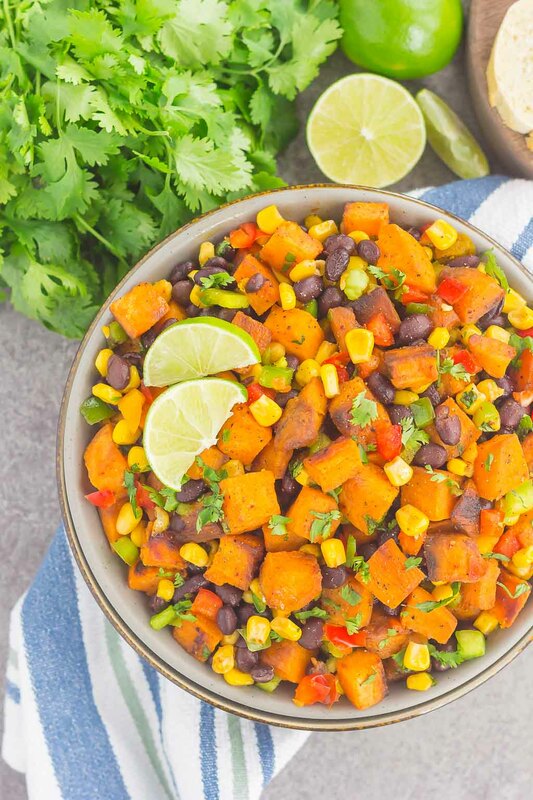 While sweet potatoes are roasting, add black beans, red and green peppers, and cilantro to a large bowl. Add olive oil, lime juice, and honey. Stir to combine. Once sweet potatoes are roasted, add to large bowl and toss to coat. Adjust seasonings, if needed, and top with additional fresh cilantro, if desired. Refrigerate for at least one hour, or until ready to serve. Salad can be eaten hot or cold. This is THE best way to enjoy potato salad in my mind because sweet potatoes are my favorite and there's no mayo! I love all the colors Gayle -- this is perfect to enjoy all summer long! 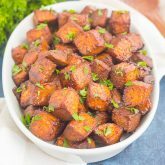 I definitely do not eat enough sweet potatoes in the summer and this sweet potato salad is the PERFECT way to change that! Love all those southwestern flavors! This salad looks amazing! Perfect for summer! Sadly I haven't been eating sweet potatoes while on Keto, but I'll allow myself to have a cheat day some time soon and try it. Pinnied. Thanks, Mira! Such a great alternative to regular potato salads.